While we at Trademark Wedding & Events do not claim to be stationers ourselves, we have partnered with some phenomenal companies who can ensure that you end up with the perfect invitation suite and printed items no matter what your budget may be! Through our partnership with Carlson Craft, we are thrilled to be able to bring you some truly unique invitation suites that will have your guests anxiously anticipating your event! Minted is an amazing online site that offers a wide variety of printed wedding materials from Save-the-Dates to invitations and place cards to table numbers! Through our partnership, we're able to offer you 25-30% off any wedding related pieces. 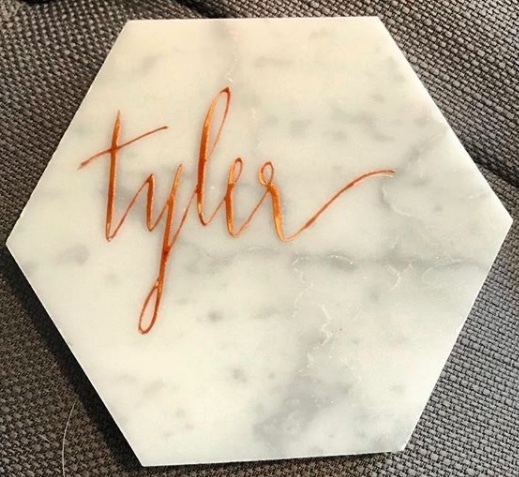 Trademark is proud to offer in-house calligraphy services for place cards, seating charts, invitations, signage and just about anything you can imagine! Contact us for pricing and additional information.